February 05, 2018 at 12:30 am. MINNEAPOLIS — On a record-setting offensive day, it was the lone sack of the game that may have won Super Bowl LII for the Philadelphia Eagles, 41-33 over the New England Patriots on Sunday at U.S. Bank Stadium. 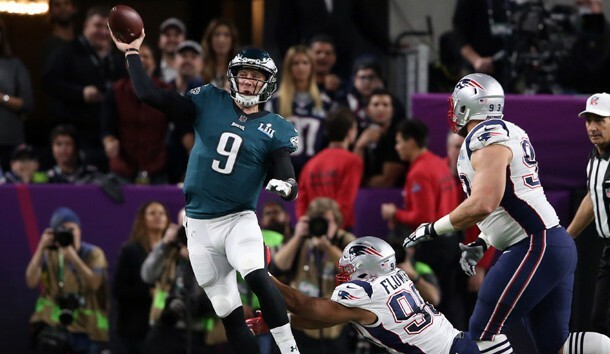 Eagles quarterback Nick Foles completed the NFL’s most unlikely underdog story, throwing for 373 yards and three touchdowns, plus catching a touchdown pass in leading Philadelphia to its first Super Bowl title. He was named Most Valuable Player. “That locker room is a special one, and you could see that in the game. No matter what happened, we stuck together,” said Foles, who came on in relief when starter Carson Wentz went down with a knee injury in Week 14 against the Los Angeles Rams. Patriots quarterback Tom Brady was even better, breaking his own Super Bowl record with 505 passing yards and three touchdowns, and staking New England to a one-point lead with 9:22 to play. But Foles led a go-ahead drive, hitting Zach Ertz with an 11-yard touchdown pass with 2:21 left for a 38-33 lead. Ertz caught the ball a few yards shy of the end zone, took two strides and then dived across the goal line, hitting the ground and having the ball come loose. After a lengthy review, the play stood as a touchdown. On the Patriots’ next drive, Philadelphia defensive end Brandon Graham hit Brady and jarred the ball loose. Derek Barnett recovered the fumble, and the Eagles got a 46-yard field goal from Jake Elliott, who early in the game missed an extra point, for an eight-point lead. On the game’s final play, Brady’s desperation heave into the end zone fell incomplete as the clock hit zero, setting off a rain of green and white confetti inside the downtown Minneapolis stadium. Despite earning the NFC’s top record at 13-3 in the regular season, the Eagles weren’t picked to win any of their three playoff games, prompting many fans to wear canine masks and embrace the underdog image. After the game, more than one Eagles player held aloft newspapers with “Top Dogs” as the headline. The teams drove up and down the field seemingly at will all game, shattering the record for most total combined yards with 1,151. The previous record of 929 was set in Super Bowl XXII in 1988 between the Redskins and Broncos. The Eagles’ last NFL title came in 1960, before the Super Bowl era. Philadelphia opened a 22-12 lead by halftime after a track meet of an opening 30 minutes. The teams combined for nearly 700 yards of offense. There were more missed extra points (two) than punts (one). Foles spurred the 10-point lead by throwing for a touchdown pass and catching another. His biggest miscue was a tipped pass intended for Alshon Jeffery that was picked off deep in Patriots territory by safety Duron Harmon. Brady used that opportunity to lead a 90-yard drive that ended with the only New England touchdown of the first half. The drive was capped when James White got loose for a 26-yard touchdown run, pulling the Pats within 15-12 at the two-minute warning. But Foles led one more march down the field before the half, and earned the 10-point halftime lead when he caught a 1-yard pass from tight end Trey Burton with 34 seconds left before the break. The teams traded field goals on their opening drives of the game, marking the first time in the Brady-Bill Belichick era that the Patriots had scored first-quarter points in a Super Bowl. Foles hit a well-covered Jeffery in the corner of the end zone for the game’s first touchdown. Elliott’s extra-point attempt was wide right for a 9-3 Eagles lead. Stephen Gostkowski’s 26-yard field-goal attempt on New England’s next drive hit the left upright after a mishandled snap. Blount, who won the Super Bowl with the Patriots last season, made it 15-3 via a 21-yard run, then Gostkowski made good from 45 yards out, cutting the Philadelphia lead to 15-6. Patriots tight end Rob Gronkowski had just one catch in the first half, but hauled in four from Brady on the opening drive after halftime, including a 5-yard crossing pattern for a touchdown that cut Philadelphia’s lead to 22-19. Foles answered right back, hitting running back Corey Clement at the back of the end zone with a 22-yard pass that was upheld as a catch after a lengthy review, putting Philadelphia up 29-19. But Brady did Brady things once more with a 26-yard touchdown pass to Chris Hogan, once again cutting the Eagles’ lead to three. Elliott hit a 42-yard field goal on the second play of the fourth quarter, putting the Eagles up 32-26. That gave Brady the opening he needed to give the Patriots their first lead, and he did so by hitting Gronkowski with a 4-yard fade in the left corner of the end zone. Gostkowski’s extra point put New England up 33-32. The Patriots, who won last year’s Super Bowl in overtime, did not punt in the game. They are now 5-4 all-time in Super Bowls.